Over the past several months we’ve been exploring a new approach to “ecovillaging,” founded on a sustainability-based cooperative model developed by Joel Rothschild and the Ecovillagers Alliance. Steve Welzer had reached out to Katie McCamant to find the closest “graduate” of the 500 Cohousing Communities program, and this turned out to be Joel, who is that and a lot more as well. He is part of a wider Ecovillagers Alliance, and has a more comprehensive view of the process than we had conceived of before, one which effectively seeks to build a committed, well-informed, and fully-democractic community before identifying a suitable project. And by a “suitable project,” he believes strongly that this should be not be a “greenfield” ecovillage but one that reuses and revitalizes workable urban neighborhoods. And our goal should be to transform the wider community by demonstrating the power of the cooperative business model and engaging local residents and their neighbors to be part of this New Cooperative Movement. This is, as we’ve discussed, pretty much the opposite approach to the one we have been taking, which was to try find a suitable property first and then build a community around it. And yes, it was a “greenfield” project, albeit one that was already zoned for a mixture of market-rate and affordable clustered housing, which was what we saw ourselves as building — several entirely new, ecological, and human-scaled neighborhoods in what has been an economically-depressed Sussex County town. And we were effectively operating as a nonprofit developer seeking to build the neighborhoods first and then have people purchase units in a conventional condominium structure. At the September 11, 2016 gathering the “Core Team” announced an intention to join the Ecovillagers Cooperative when it is launched in January, and to use the intervening months to discuss specific communities and/or topic areas of interest as part of the process of building up to founding assembly. I have posted some of the thinking that led up to this (see The Story So Far… A Brief History of EcovillageNJ), for the benefit of those who may just be getting involved or re-involved. 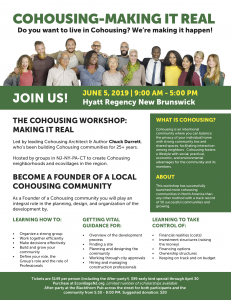 And we’re sharing some of what we’ve learned from this series of sessions with Joel, and this last time also with Harmony Eichsteadt (another member of the Alliance), and inviting our members to join a list of those interested in becoming investors in the Co-op and as part of the New Jersey Chapter or contingent. Here’s the handout from the session: crcs-evnj-ecovillagersco-opstatement-11sep2016. Incubation of new green organizations and businesses, including the Bicycle Kitchen, Cafecito Organico, the Food Lobby, Pacific Electric Worker Co-Op, Relampago Wheelery, the LAEV Family Childcare Service, Urban Soil-Tierra Urbana Limited Equity Housing Co-op, and the Beverly Vermont Community Land Trust. LAEV intentional community members also helped start or grow CicLAvia, the LA County Bicycle Coalition, the Los Angeles Permaculture Guild, the Arroyo Seco Network of TimeBanks, and the multi-school White House Place Learning Garden. and last, but not least, the CRSP [Cooperative Resources & Services Project] Ecological Revolving Loan Fund (ELF). This is a good place to start. We’ll be posting more answers and further information as time permits. This entry was posted in Cohousing, Community, Cooperatives, Ecovillage, Ecovillagers. Bookmark the permalink.